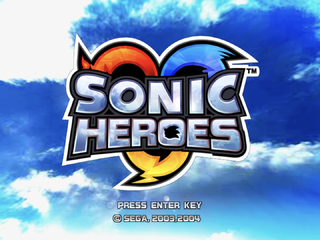 Sonic Heroes lets you control teams of three characters and change between Speed, Flying, and Strength whenever that character is needed. The Team Blast quick build-up glitch, by pressing Attack and switching to Power while using Fly doesn't work on the PC version. This glitch is GameCube exclusive. More stuff here and here. Apply the code below to be greeted by this screen when first starting the game (PlayStation 2 US). The second page options do not work properly anymore. X / Circle to change level order. It is unclear what this means or if it works properly anymore. D-Pad Right / Left to move through options. 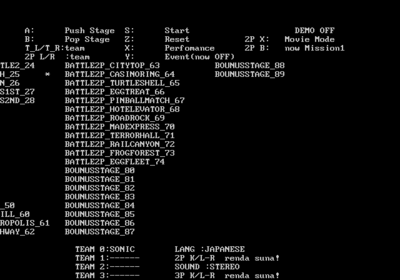 For the PC version, change the value at 0x54E8 (0x2750B if using Story Mode) in Tsonic_win.exe from 02 to 03 (to enter the level debug menu) or 05 (to go to the movie debug menu). (GameCube US) will enable a debug display during gameplay. Alternately, apply the code below for the PlayStation 2 US version. The PS2 version of the code will lag the game a lot for unknown reasons. Camera Debug Info. Press Select to enable, R3 to disable. Apply the code below for the PlayStation 2 US version to enable this. Unfortunately, it doesn't appear to work correctly anymore and will lag the game a lot. Object Editor. D-Pad Down to enable, R3 to disable. Apply the code below for the PlayStation 2 US version to enable this. With the code on, press and hold D-Pad Up / D-Pad Down to increase/decrease geometry distance. Geometry Debug. Press L3 to enable. R3 to disable. 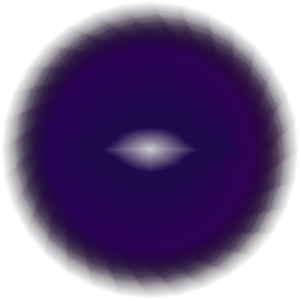 Unidus, which had appeared in Sonic Adventure and Sonic Adventure 2, is present in the game files. 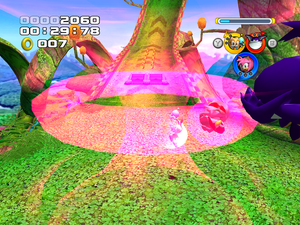 When Amy and Espio have been given their own tornado jump techniques during the development, these original tornado jump moves were scrapped and the two colors for them were put out of use. Amy's tornado was pink and Espio's was green. Thus, the voice clips to those were also not used. For the PC version, this can be put into effect by hex-editing "Tsonic_win.exe". When doing so, change the bytes at 0x1D40F7 and 0x1D4256 to 0F and then test the EXE to see if Amy and/or Espio will perform their original tornado jump moves as shown in the pictures in the beginning of the section. 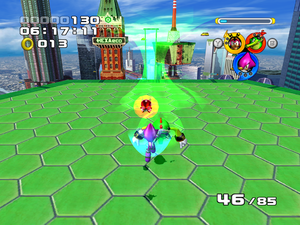 *Note: On the E3 prototype version, the leaves emit even though Espio used the original tornado technique. The textures are accessed in pretty much the same way one would access those of Grand Theft Auto III. 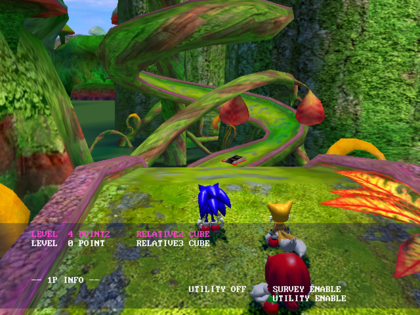 By using the Magic.TXD editor one can view, edit and create textures for all platforms Sonic Heroes was released on. A few texture dictionary files have textures for leftover objects such as those fireworks textures in stg06.txd. 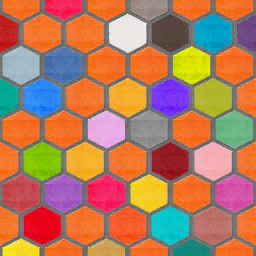 This tile texture was used to test the indirect shader to see if it functions correctly before applying to an object or a part of the level geometry. In this texture dictionary file, the 5 textures applied to the fireworks models were unused as the object was not placed anywhere in the Casino levels. This txd file has only one leftover texture applied for the colored powder objects that was left out of the game. For particles emitting from the mushrooms, they use "ef_p00" from the cmn_effect.txd file instead. There is a leftover particle texture in the main level's txd archive which has differences with the sharpness/smoothness of the textures assigned as particles for the teleporters that trigger in Mystic Mansion. On the right, it also appears to look like the particle texture was painted with watercolor painting. 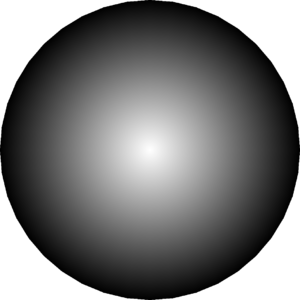 Included in the textures for Stage 14, Final Fortress, is a 512×512 version of the sky texture. Only the 256×256 version is used in the stage and subsequent boss fight. The test indirect texture files "indirect_test.txd", "e3Adv.txd" and "play_ground.txd" located in the textures folder were also stored as leftovers. For the cmn_effect.txd file in the PC version, the blue crescent particle which is named "ef_solid" went missing and the shuriken explosion would disappear with the particles being invisible as the developers forgot to add it to the txd archive. Strangely, the PC version is essentially "padded" with duplicate texture files, such as "event____.txd" files. Also, comsoon.txd is empty. 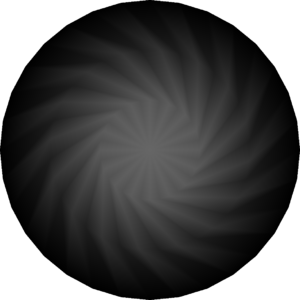 The silver swirl warp effect that was going to be used in one of the warp objects went unused and the file to that is "adv_ef_warpb.dff" which is located in the dvdroot folder and the comobj.one archive. Unlike the two other warp effects, this one rapidly permeates on the screen and quickly teleports the player to another position. It can be used in the game by hex editing the byte at an object offset such as 717FB from 58 to 60 and 71967 from 54 to 5C and then test it to see if this warp effect will be in use when you use a transportation object. For the orb switch, their codes are 68 at 103132 and 64 at 10333D. The access to the demo gameplay feature that pops up after doing nothing on the title screen in the PlayStation 2 version and GameCube prototypes was left out of the PC version, but can be re-enabled by replacing the original array at 5698A with 80 F9 06 0F 4D CB before testing the edits out to see if the demo gameplay will be used after the opening movie. Add codes for other versions. 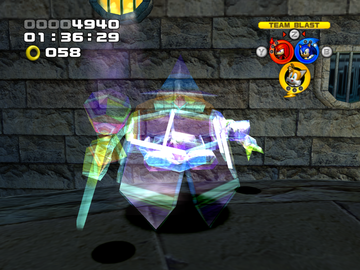 For the Magician/Bishop Robot that appears in castle-themed levels, there are material opcodes in the PC version starting at 212D5F (612D5F in RAM) which render the robot transparent with additive alpha blending which was never used by any of the enemy's techniques. However, editing the byte array at 210F83 from 00 00 80 3F to a lower float code in little endian may render a transparent version of the robot after it appears on the placed location. There are also material flags that aren't used in the game especially to the objects that are leftovers. Examples of that include the Fireworks object at 0xB4AC3, the hint collision (which is a 72 flag pointer) at 0x75137, the green thunder at 0x48A700 and the three powder objects at 0x468ED4 (Green), 0x468EE4 (Pink), and 0x468EF4 (Yellow) on PC. 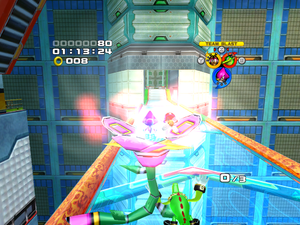 Team Rose's levels finish about halfway through the full level, which is played by Teams Sonic and Dark. 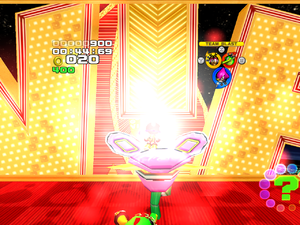 However, using glitches, exploits, or cheats, one can have Team Rose explore sections of the level beyond the Goal Ring. Oddly, some of these areas still have rings and other items that the Team can collect. At the end lies the Goal Ring used by the other teams. In competitive ring challenges, the use of these areas for Team Rose is crucial. Some of these places can also be accessed by Team Chaotix. Despite never entering these areas, some teams have dialogue for them which goes unused. 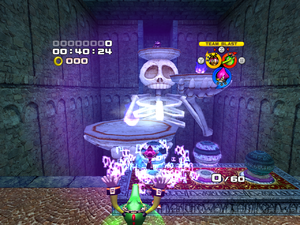 Another example is that the last area in Mystic Mansion where the torches and hammer enemies are cannot be accessed with other teams unless a cheating device is used. The rings and others are located in the same placement as for Team Chaotix in Super Hard. 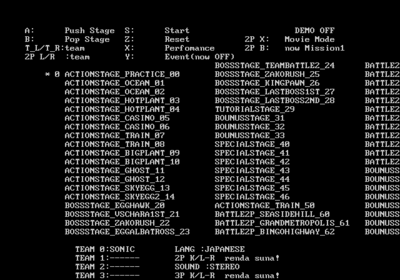 to "%AppData%\SEGA\SONICHEROES\sonic_h.ini" will disable all voice clips that do not have accompanying subtitles (such as attacks, idling, and scoring). As seen here, there's a self-destruct switch out of the wall in Team Rose's Final Fortress, to the left of where it normally is. If you fly next to the left wall, you'll be able to see it, and you can actually press it if you use glitches. A lot of voice files in the PC version are empty for unknown reasons, most notably Cream's A-rank line. In the versions that don't have this problem, she says "I'm so happy, I want to tell everyone!". The subtitles for most of the other empty voice clips will still appear, however. There are some clips in-game for when the characters explain the bobsled controls. However, these explain that if the Flight character is thrown off, the bobsled won't be able to jump. The order for character removal is Speed, Power, Flight, so when the Flight (i.e. last remaining) character is thrown off a life is lost. This hints that previously, the order for character removal was different or random. When fighting Metal Madness, the Hint Orb at the right makes Team Rose say that the boss will shoot fire if you grab his right arm (the flame-shooting arm). Maybe this battle was different earlier in development, because you can't do anything even remotely close to grabbing in it, and the moment he decides to shoot flames appears to be random. There are many differences between the GameCube, PS2, Xbox, and Windows versions. The GameCube and PS2 versions have no music in the File Select screen, while the Xbox and Windows versions do. Team Sonic's intro lines during Team Select only play all the way through on GameCube. All other versions cut Knuckles off mid-sentence. No other teams get cut off, but the fade is faster. The NTSC-U and NTSC-J PS2 versions are the only versions to have a voice language setting, which lets you choose between the Japanese and English dub as well as being able to change the language for text. The GameCube, Windows, and PAL PS2 versions only have a menu to change text language. The Xbox version has both voice languages present, but has no language menu and uses the set console language. Data for Korean localized text is present in all versions, but only selectable on Windows. 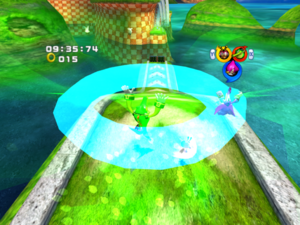 The PS2 version has no progressive scan support and runs in 30 fields per second, as well as having texture layering issues in certain places, resulting in a decidedly unclean image. Both the Xbox and GameCube versions support progressive scan and run at 60 frames (or fields, when in interlaced mode) per second. The Windows version also runs at 60 frames per second (though this was able to go lower depending on hardware capabilities) but lacks an interlaced mode, being a PC game. Certain texture animations are missing in the Xbox version. The Xbox version contains FMVs at a higher resolution and bitrate. These were replaced with the GameCube FMVs for the Windows version due to install space concerns (hard drives were rather small at the time), but the Xbox FMVs can be patched back in. 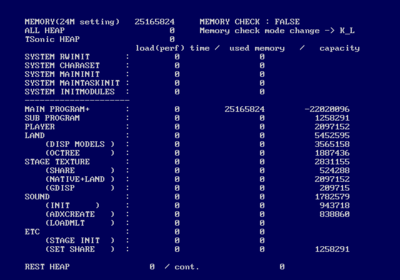 The Windows version uses a different font for its HUD. It is higher quality and appears to be either Vipnagorgialla (used previously in Sonic Adventure 2) or a stretched version of Kimberley, the game's own display font. The Windows version does not reuse the Xbox version's button icons and instead replaces them with genericized versions which are all gray in color and use the letter Z for the Team Blast button, rather than the Xbox version's black face button. The stripes are missing from Big's model in the Windows version, though this can also be patched back in. 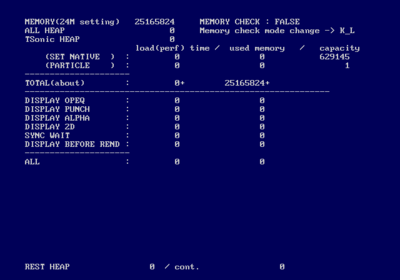 The Windows version contains HUD textures with fewer compression artifacts than those in other versions. The Windows version makes use of a launcher, with which higher resolutions can be selected. The shading in-game is also somewhat improved. 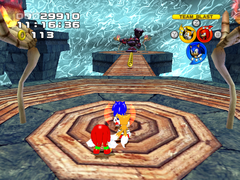 In the Windows version, Speed characters in Team Battles on the enemy team do not enter a falling animation when hit and only lose rings, making them harder to defeat. 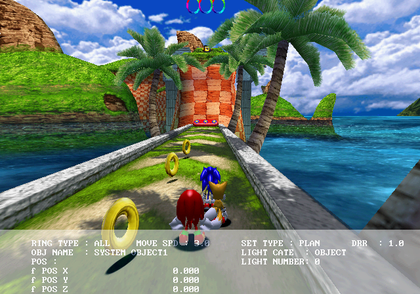 An alternate camera mode was added to the Windows version a la Sonic Adventure DX's (even sharing the name - Free Camera), however this does not enable full dual-analog like that does. All versions of the game allow the player to move the camera left and right with the right analog stick, but if the stick is moved up or down while standing still, the player enters first-person mode. This still occurs when Free Camera is enabled. The addition of the new option forced a redesign of the pause menu. 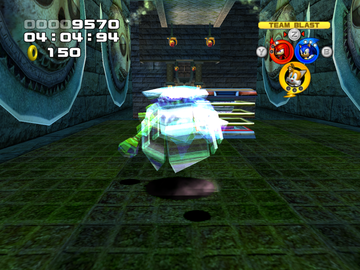 The Xbox version contains a brightness setting, and the GameCube version has a setting for a deflicker filter. In the PS2 version, the Cross (X) and Circle (O) buttons were not switched from their Japanese functions (being no and yes, respectively) in the NTSC-U version, suggesting that this was an oversight by the localization team. The button assignments were switched in the PAL release. This page was last modified on 6 April 2019, at 16:24.